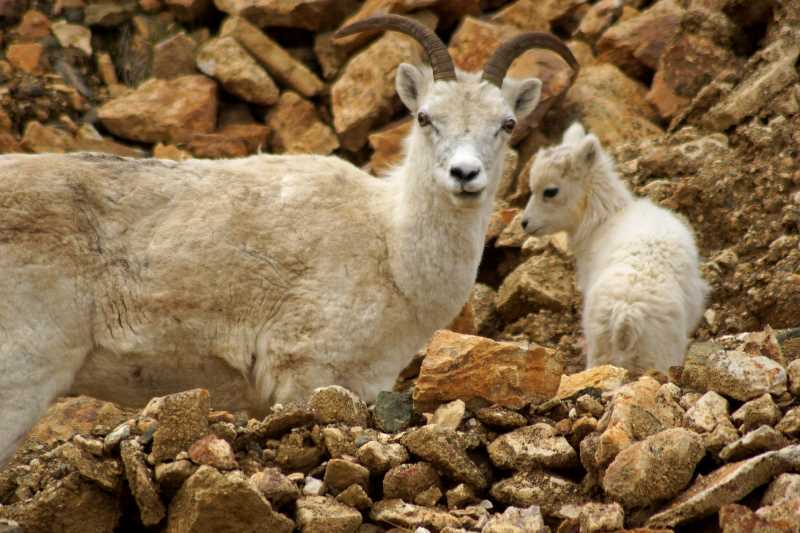 Denali National Park is an extraordinary place, but the casual visitor wouldn’t get to appreciate most of it, if it wasn’t for the Denali Park Road. This 92-mile road turns to dirt after mile marker 15, and beyond that point, private vehicles are not allowed. In order to see this part of the road, you’ll need to buy a ticket on one of the park’s shuttle buses or tour buses. If you want to see what you’ll find on the first 15 miles of the park road, I’ve written about that part of the park on a separate page. 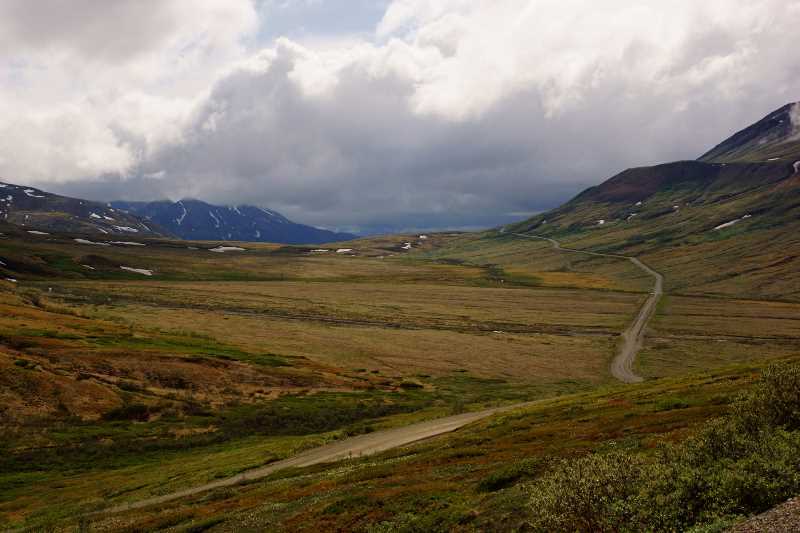 This page covers everything between mile marker 15 and 66 — the Eielson Visitor Center — which was the most distant destination available during my visit in early June. 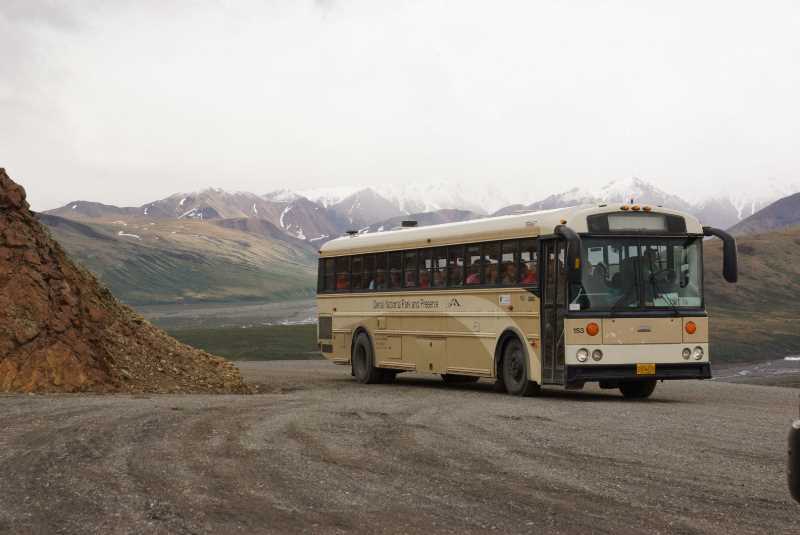 The journey begins at the Wilderness Access Center, a transportation hub for all of the buses that travel Denali’s park road. Here, you’ll buy your ticket, and then wait for your departure time. I arrived just in time to purchase one of the last seats on the next available bus, so I didn’t have to wait long. 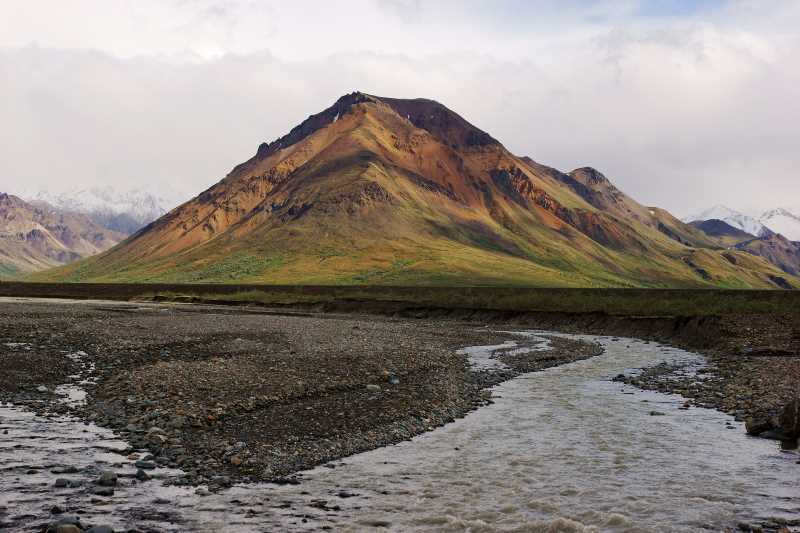 Toklat River, Mile 53 – Toklat River is beautiful, and if you travel this far, you’ll also be able to stop at the Polychrome viewpoint. 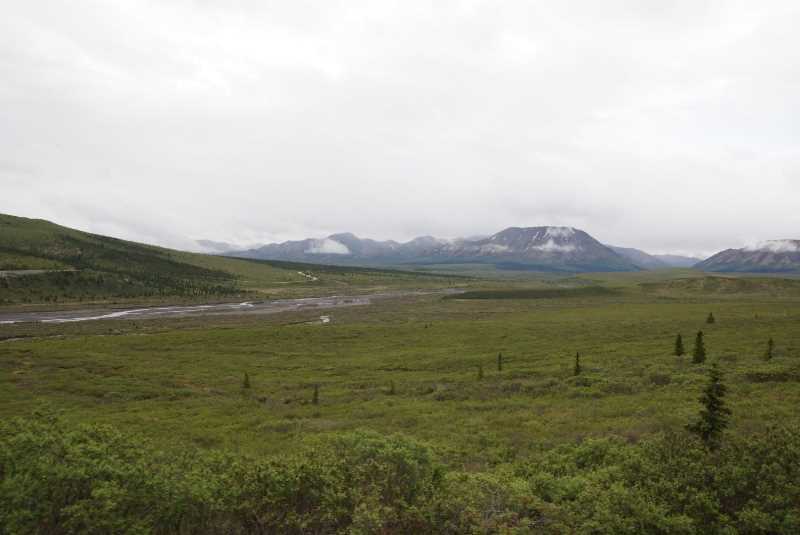 Eielson Visitor Center, Mile 66 – This is the destination I chose, because in early June, it’s the most distant one available. 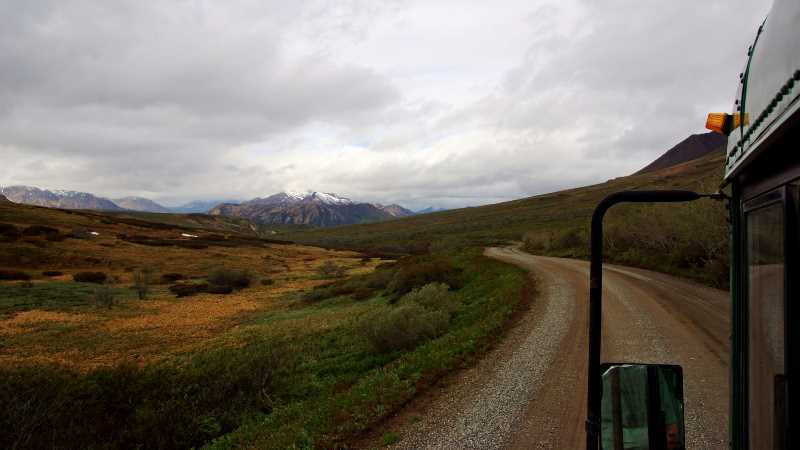 You’ll see plenty of scenery on this part of the road, and Eielson offers some hiking trails, as well. Wonder Lake, Mile 84 – On a clear day, Wonder Lake offers a beautiful view of the mountain, and you may even capture a reflection of the mountain in the lake. There is one developed hiking trail at this stop. Keep in mind, though, 168 miles (round-trip) on a school bus makes for a very long day. Kantishna, Mile 92 – This is the end of the road. I’ve heard that there isn’t much to see at this old mining outpost. 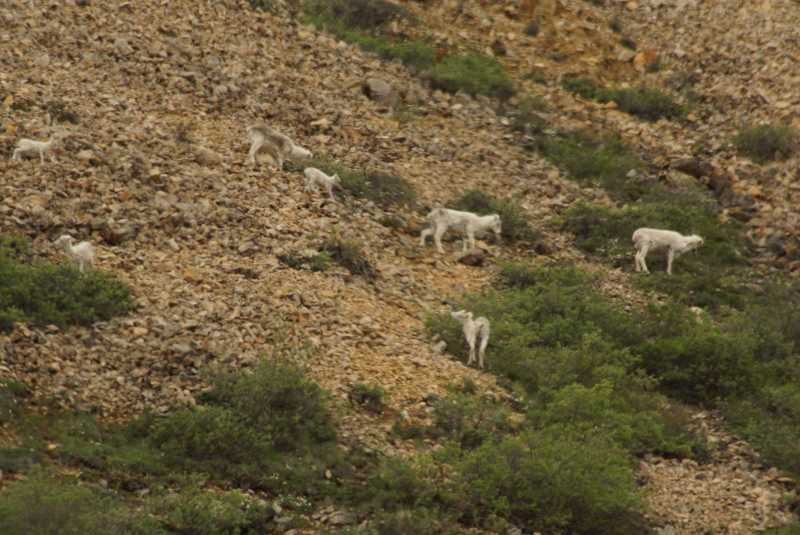 There is, however, a very pricey accommodation here, if you’d like to spend the night in the deepest wilds of Denali National Park. Camper Bus: These are also green buses, but some of the seats have been removed to allow room for camping gear. Tour Bus: These buses are brown. Rather than simply provide transportation for do-it-yourselfers, these buses provide narration along the way, more comfortable seating, and snacks. No matter what kind of bus you choose, the bus will stop for wildlife viewing. It will also stop at several designated rest areas to provide bathroom breaks and stretch-your-leg opportunities. Shuttle buses are much cheaper than tour buses. As of 2016, a shuttle bus to Eielson costs $34, to Wonder Lake costs $46.75. You’ll also need to pay your park entry fee (or show your annual park pass). Keep in mind, you can hop on and off a shuttle bus, whenever you wish — just in case you want to take a lonely walk on the park road. We hadn’t even made it off the pavement when the wildlife sightings began. 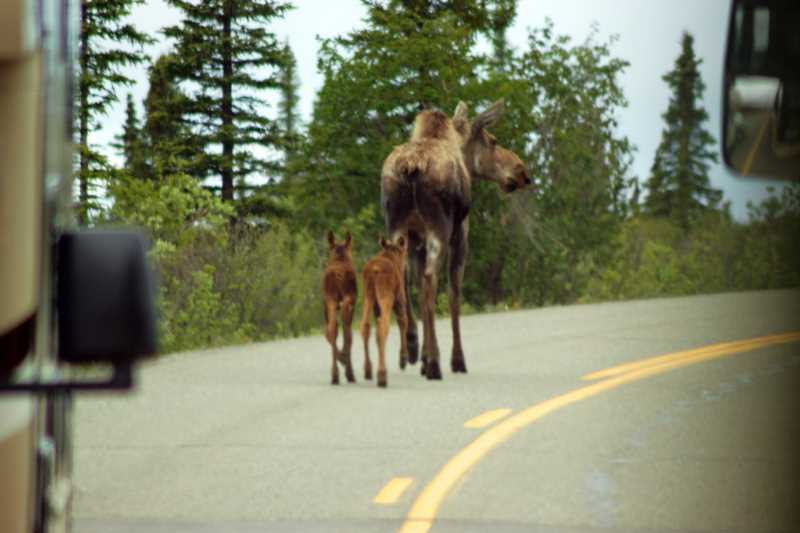 I also saw this mama moose and her calves while driving the road in my car. She really likes to walk down the middle of the road and stop traffic. 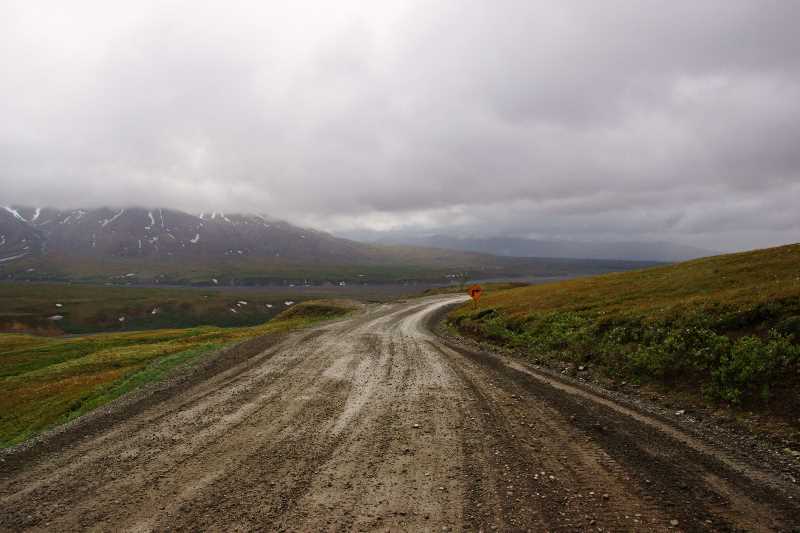 At Savage River, the road turns to dirt, and the bus passes by a checkpoint. Now, we’re on the part of the road where private vehicles are prohibited. … the bus stopped for a well-developed rest area at Teklanika River. There really is just one thing to see here — the river — and as you can see, everyone poured off the bus and headed out to the viewpoint, to take the same picture. If you wish, you can hike down to the river, and hike up or downstream, however far you wish, then return and catch the next shuttle bus. Back on the bus, I tried to take a few pictures out of the window, but it isn’t easy. As the bus headed down to the East Fork River crossing, I snapped this picture out the window. Later in the day, I would walk this part of the road. When you’re walking, you can take much better pictures. … that were actually on the park road, on the return trip. I shot this photo through the windshield of the bus. 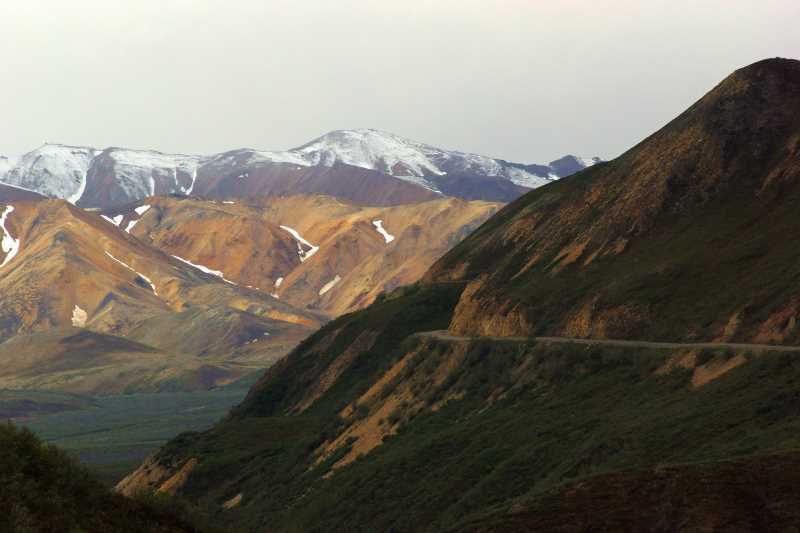 I’d be willing to argue that Polychrome Pass is the prettiest spot on the park road. The outbound bus stopped here for a 10-minute break, but that wasn’t nearly enough to shoot all the photographs I wanted. The viewpoint provides an excellent look at the colorful volcanic mountains to the south. With a good zoom lens, you can frame-up some impressive shots of the landscape. … and a tour bus rolled in, our group had to leave. I should have gotten off here and walked for a while, in one direction or the other. Of course, it’s not always a good idea to be outside the protection of a big metal schoolbus. 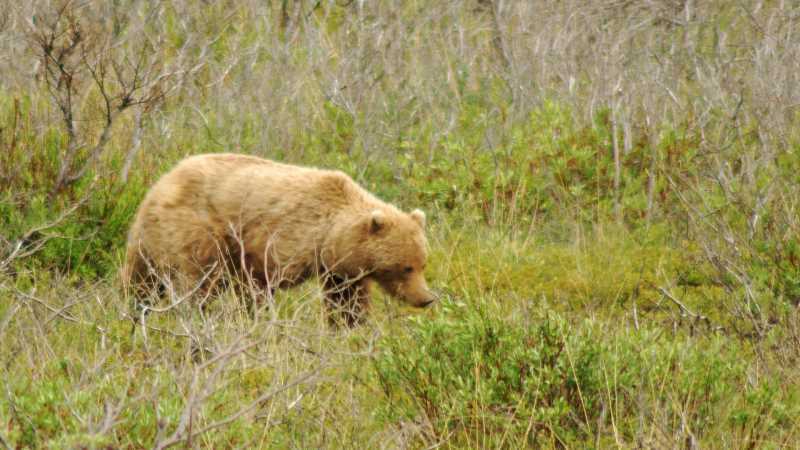 On the return trip, our shuttle bus driver spotted this brown bear moseying along on the south side of the road. Everyone took pictures, and then moaned as the driver declared that it was time to start moving again. 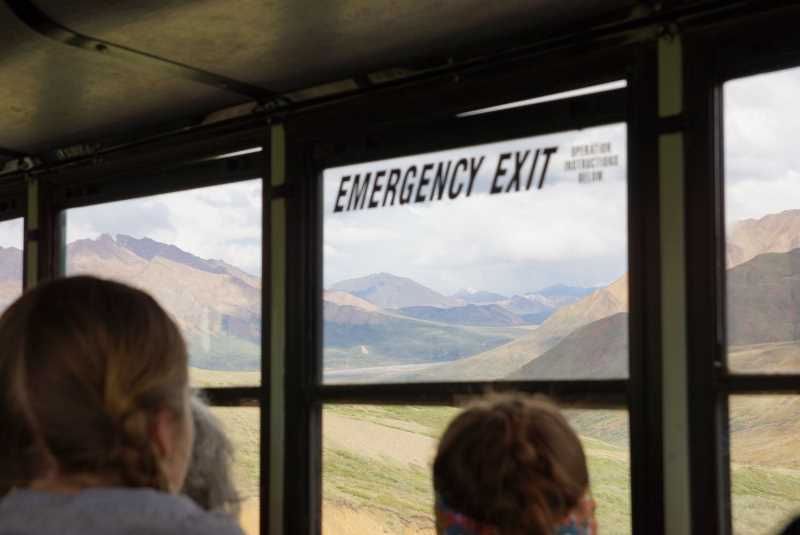 That’s the thing about the shuttle buses — they will stop for wildlife viewing, but they have to keep to a schedule, so you might not get to stay and watch the wildlife as long as you’d like. The next rest area is at the Toklat River crossing. On the return trip, there was just enough blue in the sky to allow some light to come through, illuminating the surrounding mountains. 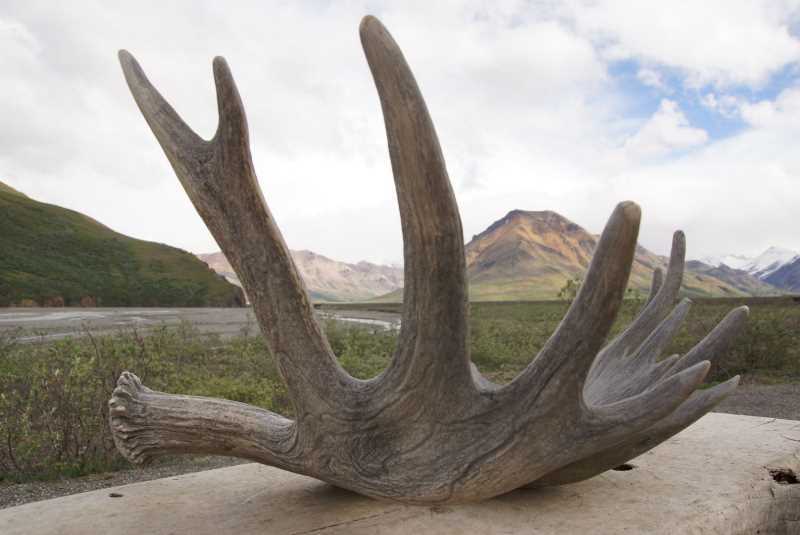 Some giant moose antlers are on display at the rest area, allowing for some great photo opportunities. The Toklat River rest area also has an excellent bookstore/gift shop inside a tent, which provides a welcome retreat from cold, windy, or rainy weather. You’ll probably wish the stop was longer, but remember, you could always stay behind and catch the next bus. 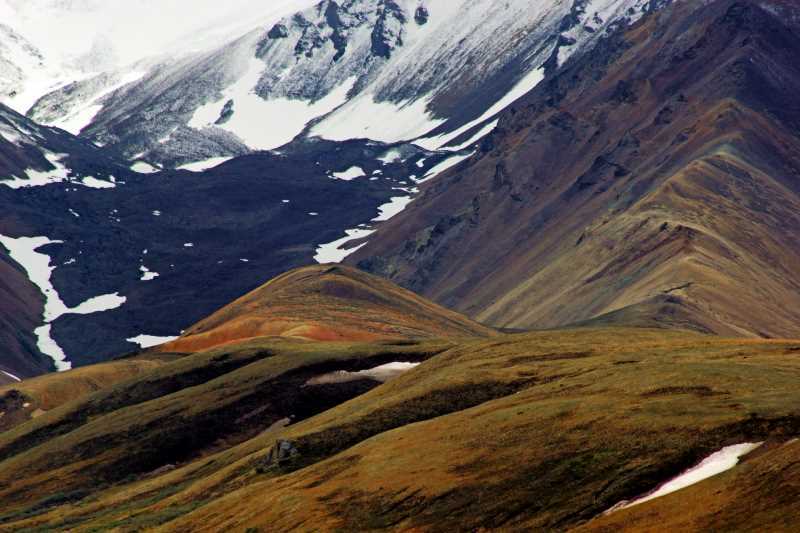 Beyond Toklat, the road climbs again, this time reaching its highest point at Highway Pass, elevation 3,980 feet. Just east of the pass, I shot a photo of the view from inside the bus. If you’re looking for another good spot on the Denali Park Road to get out and walk, I’d suggest the Stony Hill Scenic Overlook. It’s at mile 62, so you’re almost at Eielson — heck, you could even walk from there to here before hopping on a bus. Unfortunately, the shuttle bus (both coming and going) did not stop at this great spot. I captured a few pictures out the window. And as great as this view is, just imagine Denali, Mount McKinley, standing right in the middle of it all. Yes, that’s where the mountain is supposed to be. But, your odds of seeing the mountain on any given day is about one in three, because clouds around the mountain are so common. 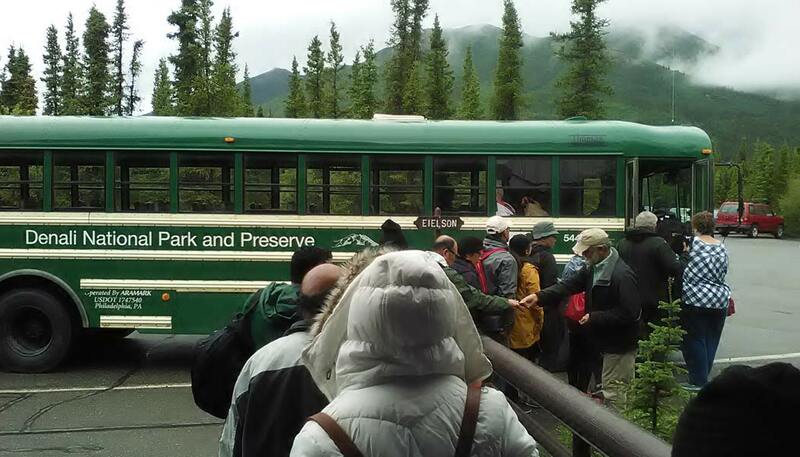 When it was time to depart Eielson, I decided to start hiking, and then catch the bus when it passed me. This gave me a great opportunity to see the final mile of the road before Eielson. You can check out my road hike here. 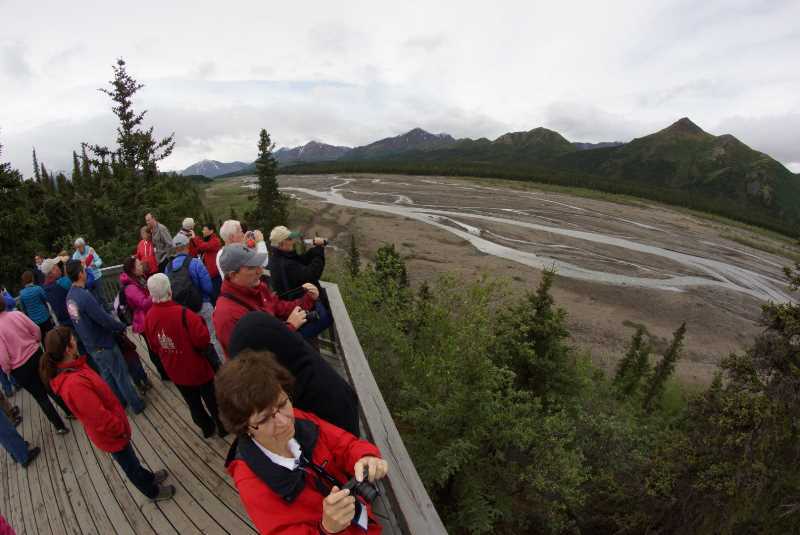 And if you want to know what there is to see and do at Eielson Visitor Center, you can check out the next page.